Freeze dried dog food & cat food is healthy and convenient. Packed with protein & nutrition, these make great meals or dog food topping. 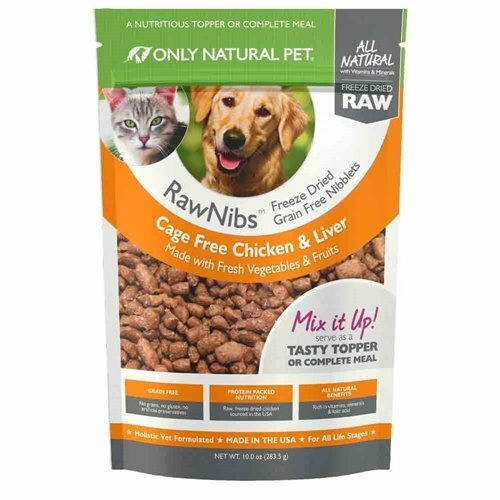 REAL RAW NUTRITION in a freeze dried, bite sized nibblet format with cage free chicken muscle & organ meat, fresh fruits & veggies, and raw goat's milk. The convenience of kibble, but the taste and nutrition of raw. USE AS A TOPPER OR TREAT so your pet can enjoy a healthy protein & nutrient boost to everyday meals or as a high reward treat. It also makes a complete & balanced meal - especially for smaller pets. MADE IN THE USA from USA sourced, high quality, naturally raised, cage free chicken that is high in protein & amino acids and has the real poultry taste your pet loves. GRAIN FREE & ALL NATURAL is healthier for your pet. RawNibs contain no grains or gluten and have no artificial flavors, colors, or preservatives. SATISFACTION GUARANTEE - Only Natural Pet products always include a 100% Satisfaction Guarantee. Only Natural Pet uses only the highest quality ingredients in our recipes. Providing you & your pet the highest quality products is our top priority.